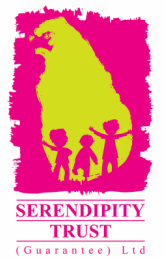 The Galle Children’s Festival is an ongoing program of events, festivals and participation opportunities, coordinated by the Serendipity Trust (Guarantee) Ltd, for children in Sri Lanka. On Sunday 26th January 2014 a Mini Festival was held in partnership with host school Olcott MV. This event aimed to celebrate and showcase the creativity of children in Sri Lanka. Children from neighboring schools came together to enjoy a range of workshops run by local and international artists and practitioners and organsiations. This event was generously made possible thanks to generous donations by the Galle Literary Festival, UK Schools and individuals from the Galle community. Refreshments were generously donated by Cargills in partnership with the Festival’s Food & Beverage Sponsors Kist, Kotmale Yoguard, Kotmale Chox, Sam’s Sausages and Magic Rainbow. The English Unit and Principal from Olcott MV provided great support with assisting to coordinate the participating schools, arranging the opening ceremony and assisting with the set up of each classroom. This event was also proudly supported by the Southern Provincial Education Department and the Galle Zonal Education Office. The Mini Festival was officially opened by Mrs. Surangi, Assistant Director of Education (English), Galle Zonal Education Office. 480 primary and secondary students from 12 local schools in the Galle Education Zone (Galle Division) participated in this exciting event. Each participating student had the opportunity to witness a range of performances during the Opening Ceremony as well as participate in 3 workshops. Each student also received a GCF Sticker, Participation Certificate, a Kist Water Bottle, Sam’s Sausages Hot Dog, Kotmale Yoguard Yoghurt, Kotmale Chox Food Drink, Kist Fun B Fruit Juice and a Magic Rainbow Ice Cream. Students worked with published author Lal Medewattegedara from the British Council to learn various methods for enhancing their creative writing abilities in English. Children created unique designs out of paper and other waste materials in this fun workshop led by the British Council, Sri Lanka. The workshop offers the opportunity to activate the inherent creative ability in every child. The activity aimed to explore, create and evoke fun with colors and fabric while the working process is considered more important than the finish product. Jon de Ath (British Council)Students worked with Mr. Jon de Ath from the British Council Library to create amazing illustrations that were entered in to a competition run by the British Council. Palitha Silva (British Council)Students participated in an interactive Drama workshop led by well-known Sri Lankan actor Palitha Silva. Nifraz, who has recently published his first children’s book, promotes a strong reading culture amongst school children as a lifelong habit. In this session Nifraz read a chapter from a Sinhala and English story with the children. They then made bookmarks. Students created their own colourful designs on terracotta vases which they could then take home as gifts for their family and friends. Volunteers from Children’s Hope gave students the unique opportunity to learn some of their favourite songs using only their hands. They also learnt many greetings to enable them to communicate with people with hearing impairments. Saving the environment was the main theme of this workshop. Students learnt how to recycle old magazines and newspapers to create colourful beads which can be turned in to necklaces and earings. Students participated in a variety of activities aimed at increasing their confidence in spoken English covering the theme of ‘Animals in the Ocean’. Students participated in a variety of activities aimed at increasing their confidence in spoken English covering the theme of ‘Animals in the Jungle’. Students participated in a variety of activities aimed at increasing their confidence in spoken English covering the theme of ‘Animals in the Snow’. Students loved getting their hands messy in this fun workshop where they created colourful images of animals using their handprints! Children discovered a little about the history of the famous Sri Lankan cultural masks before using colours and decorations to create their own! Students learnt the ins and outs of writing a newspaper article before heading out to the festival to interview participants and organisers. One selected article will be printed in the Sunday Times. Children were invited to step into their imaginations with drama and play workshops. The workshop space was a buzz with music, laughter and shrieks of joy from all the participants as they explored their creativity. Children used paper and beads to create their own beautiful handmade gift cards. Participants enjoyed this craft workshop where they ‘upcycled’ old newspapers and card to create desk organisers for their stationery items! Students experienced what it might be like to be a student in a Sports Class in Japan! In this active workshop, students had fun learning different jump rope techniques to music. Students were led through a variety of fun and interactive Drama games aimed at increasing their confidence and interest in spoken English. This was an active workshop where participants enjoyed stepping out of the box and using improvisation to learn new theatre and acting techniques. The Serendipity Trust (Guarantee) Ltd was delighted to work with so many creative and talented individuals and organisations as well as partnering with Olcott MV to hold such a unique and worthwhile event for so many students.